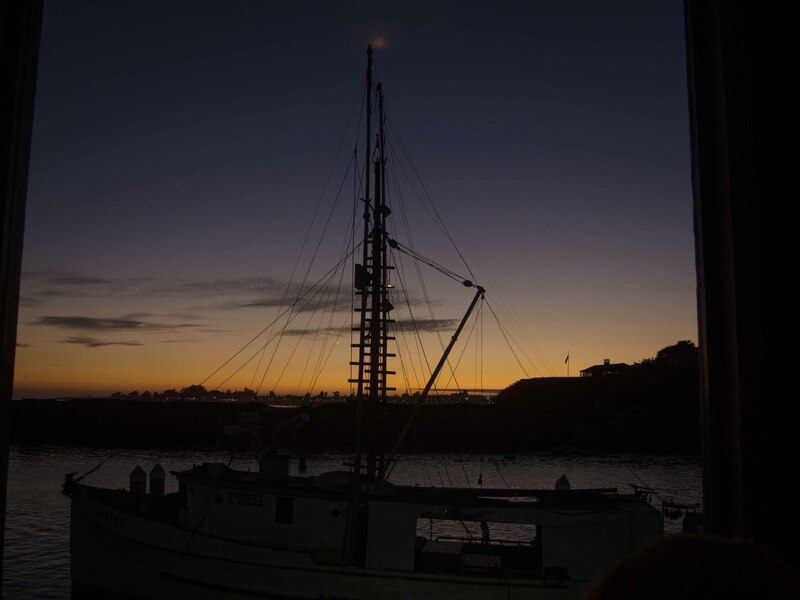 Dinner last Friday night at The Crow’s Nest, in Santa Cruz. Gail and I drove down to enjoy the day and have dinner with her sister and her cousin Mary, along with respective husbands. On the way we stopped for a bite at the Ritz Carlton in Half Moon Bay. The place is beautiful and the valet parking is very nice, but I was more than a touch disappointed in the dining room. The service was both lackadaisical and uninformed. On a whim I asked if they had a caviar menu, and our server had no idea–and when she found out, she just came back and said “It’s $110 an ounce and we have white sturgeon caviar”. No discussion of what came with it, how it was served, nothing. This didn’t inspire me enough to order any. In lieu of fish eggs, we had a cheese plate. A fairly mundane and plebian cheeseplate. I asked for a dessert wine menu, and found to my great surprise that they only offer two types of port and no other sweet wines. That a 5 star resort would have such a short wine list is astonishing to me. Then when the bill came, they overcharged me for the port I chose–and it was clear that the computer was mis-programmed, since my port was properly labeled on the bill, just the price was 50% too high. It’s a sad day when the Ritz Carlton isn’t up to snuff. On to the good stuff. We like the Crow’s Nest. 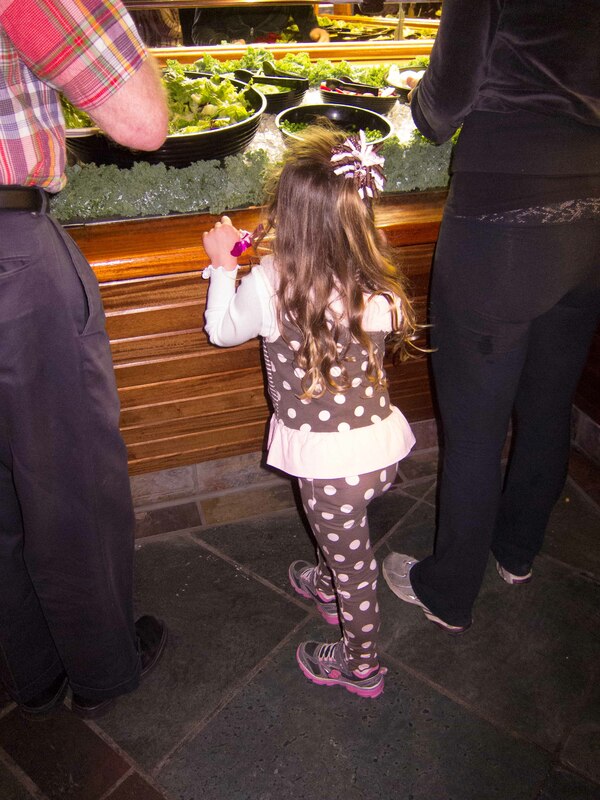 It’s been a fixture on the harbor forever, and Gail is entranced by their salad bar. 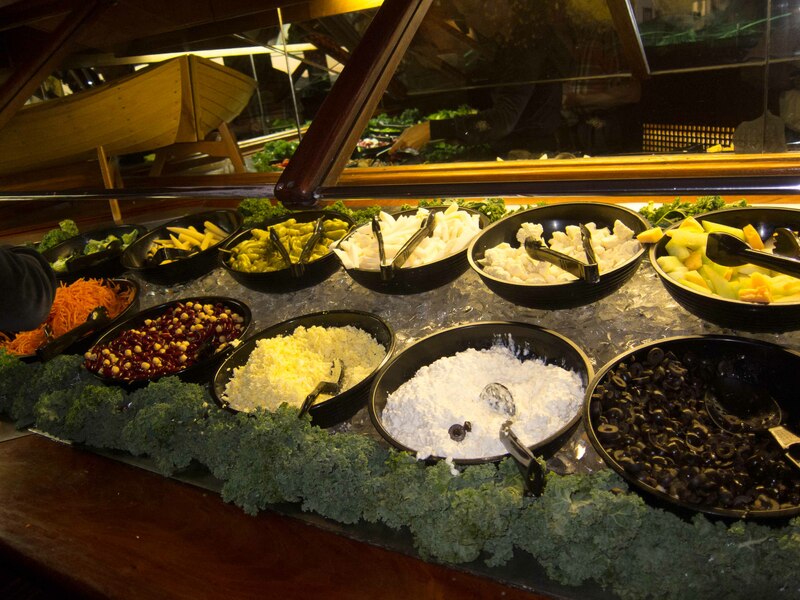 You don’t see many salad bars these days (except in Gatlinburg) and the one in the Crow’s Nest has always excelled. We got a table outside. 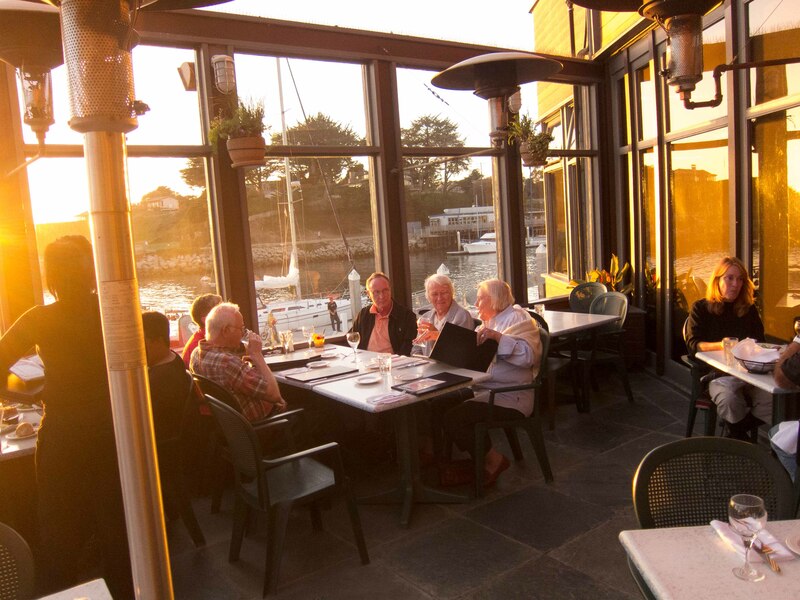 The dining area is surrounded by high glass walls, to keep the chill down, and they have large gas heaters available, so the temperature is quite pleasant. Seaside dining. The walls are topped with hundreds of nails pointing up to keep the seagulls away. It was a perfect time to eat. That’s brother in law Jim and cousin Mary facing us. The food there is not fancy, just solid seafood. 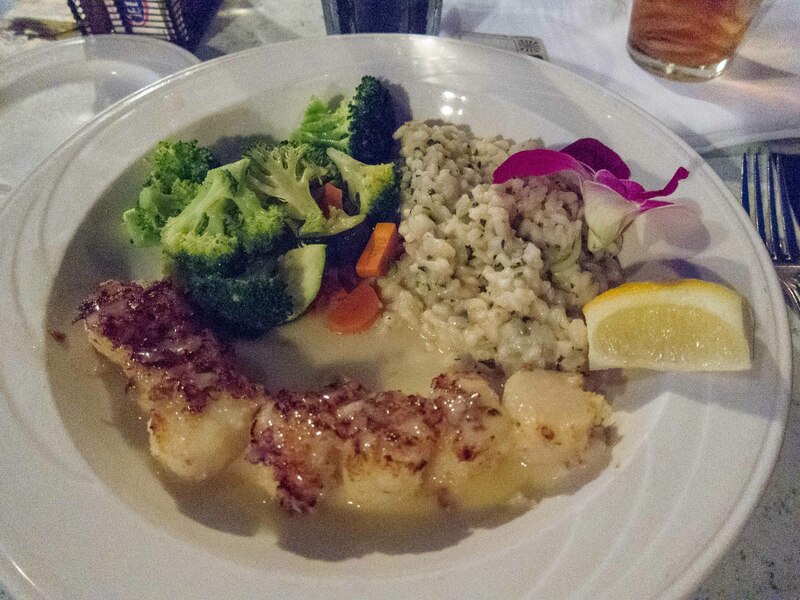 I had the scallops and risotto. Scallops and risotto. And a bright,fresh nasturtium. I always eat my flowers, doesn’t everyone? Oops, I was supposed to talk about the salad bar. My dinner came with an awesome Ahi Poke to start, but the others all chose the bar. Jimmy at the start of the salad bar. I like the little eyes peeking up at me. I’m a sucker for cute outfits. If only those pants came in my size. The salad bar continues. Everything fresh and crispy and tasty. 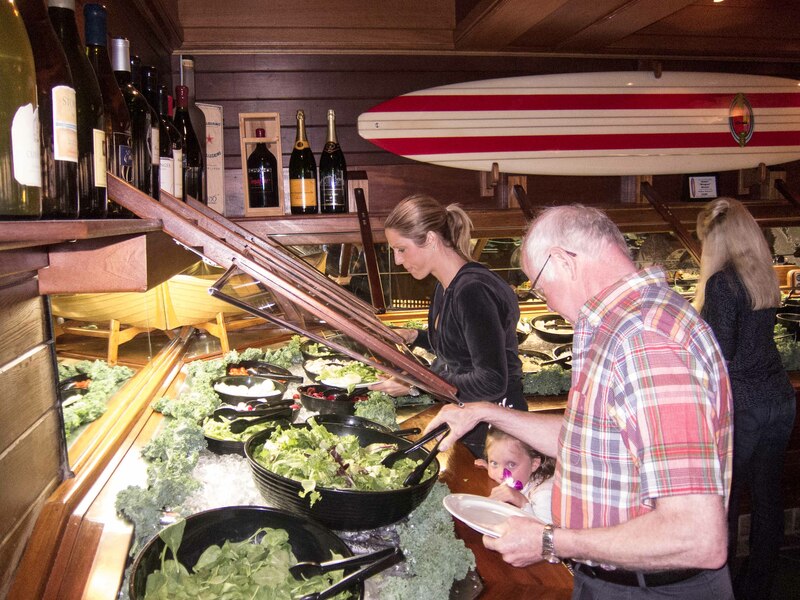 Gail’s right–it is a wonderful place to get a plate of salad. Gail had been dreaming of the enchilada all day, only to find that it is on the lunch menu, not the dinner menu. Fortunately, the waitress asked in the kitchen and they rustled on up for her. It was pretty magnificent, and food enough for two. 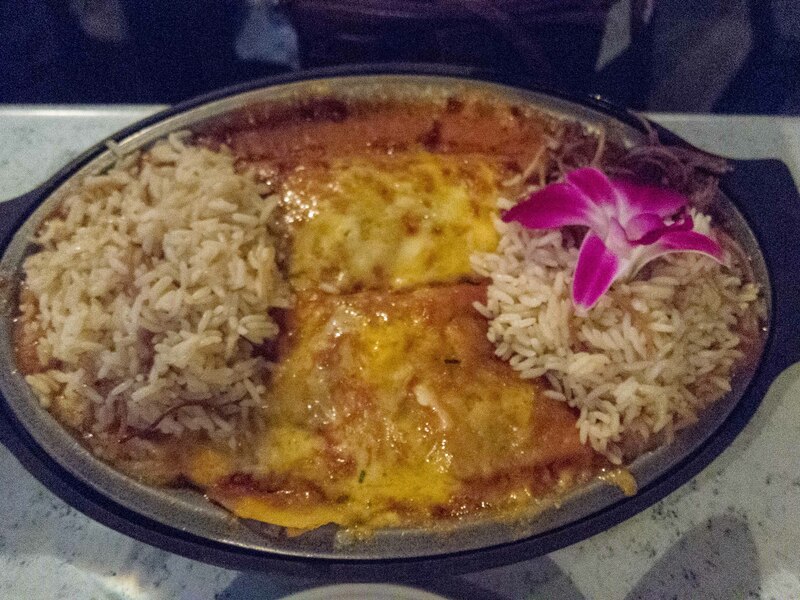 That’s an enormous plate of enchilada. The flower makes it just perfect. As the sun went down the view just got better and better. This is reason enough to eat at the Crow’s Nest. 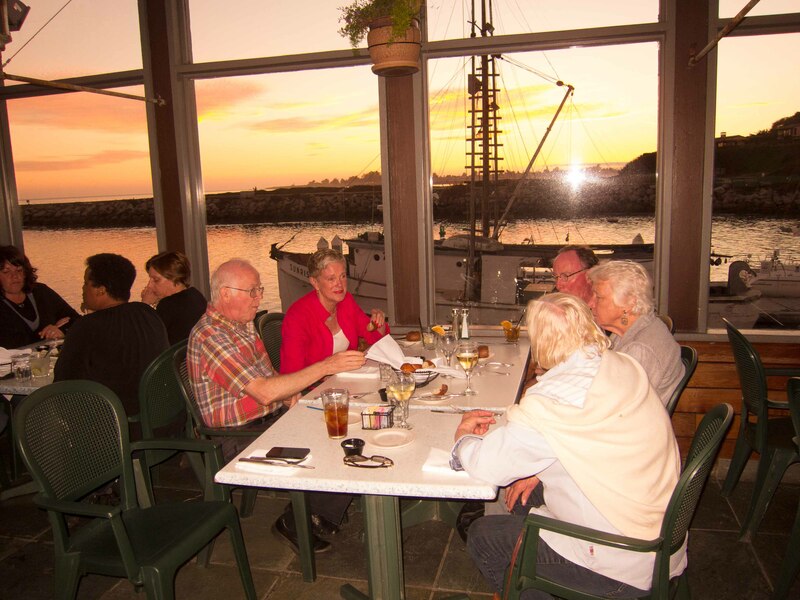 The perfect accompaniment to a meal is great company, and we certainly had that pleasure with Susan, Jimmy, Mary and John. I’d go to the Crow’s Nest anytime.